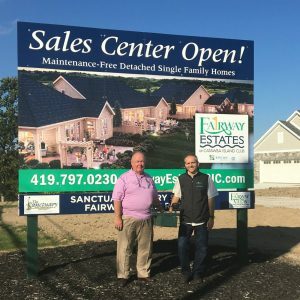 Thomas Bohlander (left) and Tony Corona, partners at Fairway and Sunshine Development in Port Clinton, OH. Location. Location. Location. That old truism in the home building business is the guiding operating principle that drives Fairway and Sunshine Development, headed by Epcon Franchise Builders Tony Corona and Thomas Bohlander. After all, Corona and Bohlander had noticed that the town of Port Clinton, OH, close to Lake Erie, was driven by tourism dollars. The population hovers between 25-30,000 during the peak summer times and dwindles down to 3,500-5,000 during the off-season. Catering to the frequent visitors seemed like a logical business strategy for the builders. Partnering with Epcon has allowed FS Development to introduce a relatively new category of residential development for Epcon: second homes. For 30 years, Epcon’s ranch-style homes have offered more than a place to live; they have nurtured a lifestyle where homeowners can move their focus away from the “must-dos,” such as lawn mowing and snow blowing, to the “want-tos.” The open floor plans and layouts factor in plenty of room for entertaining, and walking trails and fitness centers facilitate an active lifestyle. Corona and Bohlander have built on this value proposition from Epcon and positioned Fairway Estates at Catawba Island, the Epcon community they developed, as a resort community. Most buyers are essentially investing in a second home. That sizzle is seasoned in many ways: The community is surrounded by an Arthur Hills 18-hole championship golf course, and Lake Erie and the Catawba Island Club are a short walk or golf cart ride away. A bonus for active lifestyle homeowners: they can subscribe to affordable golf club memberships, enjoy in-water docks and dry-stack storage for boats and other personal watercraft or enjoy the many amenities in the Grand Clubhouse. Corona and Bohlander also offer a variety of upgrades for countertops, flooring, fixtures and more that help underscore the luxury of a second home. Corona is a custom home builder who has extensive experience in commercial building as well. Bohlander, who owned multiple car dealerships in northeast Ohio, was looking for a new project to invest in after retirement when he heard about Epcon from a friend. He sought out his good friend Corona for his background in home building, and they partnered to build Epcon homes. “The Epcon products fit especially well because we like how quickly we can build them,” says Corona, who had only been familiar with the more leisurely pace of custom home building. Over the course of five to six years, Corona built around 15 custom homes. In contrast, their Epcon community, Fairway Estates, comprises 160 homes built over a shorter time period. Epcon Franchise Builders follow Epcon’s tried and tested, copyrighted floor plans to build houses that people want to buy. What’s more, over the course of 30 years of experience in homebuilding and 20 years of experience in franchising, Epcon has fine-tuned every aspect of the process: pre-sales, building, vendor pricing, marketing, sales and more. This means that most of the wrinkles have been ironed out, so Franchise Builders can build and sell their communities quickly and efficiently. Bohlander adds that Epcon allowed them to dip into the waters of production building, an aspect of home building that would have involved too much investment and risk if they were to venture out on their own. Instead they leverage Epcon’s robust suite of marketing and sales material to boost their own capabilities. “Because we didn’t have condominium-style development and construction experience, Epcon has been a great partner for us,” Bohlander says. Corona and Bohlander also appreciate the staffing and training that Epcon provides, which Corona says was a huge bonus, especially as they were ramping up. They have taken advantage of Epcon’s marketing materials and a website template to attract buyers and supplement them with direct mail and television commercials. Corona and Bohlander believe that the most impressive aspect of Epcon is that they’re in it for the long haul. “Even during the economic downturn, Epcon did not bury their head in the sand like other franchises or building companies. They actually spent more money to work through it,” Corona points out. Epcon invests heavily in market research and constantly tweaks floor plans to respond to consumer demands. This means that Epcon Franchise Builders are building homes they can rest assured there is demand for.